Group tours and packages are available! Tranquil, Serene, Informative, are some of the words that come to mind trying to describe our visit to the Ocala Carriage and Tours in Ocala! If you love horses, come to the heart of horse country in Ocala, Florida and experience a tour of some outstanding horse farms while traveling in a horse drawn carriage. Thoroughbreds training around practice tracks, yearlings frolicking in the field, and quarter horses lazily grazing in the sunshine are some of the views you will experience. Equestrian mansions, sprawling rolling countryside, and live oak trees are draping over the streets in this Ocala setting. 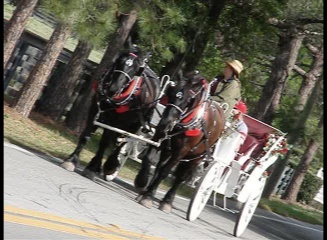 Ocala Carriage and Tours is perfect for groups, and also for couples. They have picnic facilities for catered parties and a real live princess carriage, for princess parties that are unforgettable! Our guide was so informative, it really was fascinating learning all about the horses and farms! Check out the video, and enjoy!